Background New criteria for the neurophysiological diagnosis of amyotrophic lateral sclerosis/motor neuron disease (ALS/MND) were recently proposed at an international symposium in Awaji-shima, Japan. They differ from the accepted revised El-Escorial criteria by considering fasciculation potentials to be evidence of acute denervation. In addition, when assessing diagnostic certainty, the Awaji-shima criteria equate electrodiagnostic evidence of lower motor neuron dysfunction with clinical examination findings. Methods A retrospective review of 205 consecutive sets of notes was performed, from patients who underwent neurophysiological assessment for suspected MND. The clinical signs and neurophysiological findings were combined according to the two sets of criteria (revised El-Escorial and Awaji-shima), and the diagnoses reached were compared with the interval diagnosis, to establish the sensitivities and specificities of each protocol. Results An interval diagnosis of MND was recorded in 107 patients. The sensitivity of the Awaji-shima criteria in reaching a diagnosis of MND was 60.7% and the revised El-Escorial 28%, with a specificity of 95.9% for both criteria. The Awaji-shima criteria increased the sensitivity of diagnosis without affecting the specificity. Conclusion Accepting EMG evidence of fasciculations as evidence of acute denervation increases the diagnostic certainty of MND, and the new criteria allow earlier diagnosis of MND without increasing the false-positive rate. Motor neuron disease (MND) is the third commonest adult onset neurodegenerative disorder, with an annual incidence of two per 100 000 and prevalence of five to seven per 100 000.1 MND leads to progressive muscle weakness and atrophy, with a mixture of upper and lower motor neuron signs, due to degeneration of pyramidal neurons in the motor cortex, cranial motor neurons and anterior horn cells in the spinal cord. Classical MND tends to be focal in onset, with a particular group of motor neurons affected first. This can lead to a delay in diagnosis, as early in the disease course there may be few clinical signs. An earlier diagnosis reduces the period of diagnostic uncertainty for the patient and allows the timely planning of future care and support. Additionally, commencing neuroprotective agents, such as Riluzole, while there is a larger pool of surviving motor neurons may improve any therapeutic effect.1 Neurophysiological evaluation is used in patients with suspected MND to both support the diagnosis, by finding evidence of a more widespread motor neuron dysfunction than is apparent clinically, and exclude other disorders which may mimic MND. Several sets of criteria have been proposed over the recent past, which combine the clinical evaluation and neurophysiological assessment to facilitate an earlier diagnosis of MND. (A) Revised El Escorial criteria. (B) Awaji-shima critera. ALS, amyotrophic lateral sclerosis; LMN, lower motor neuron; UMN, upper motor neuron. 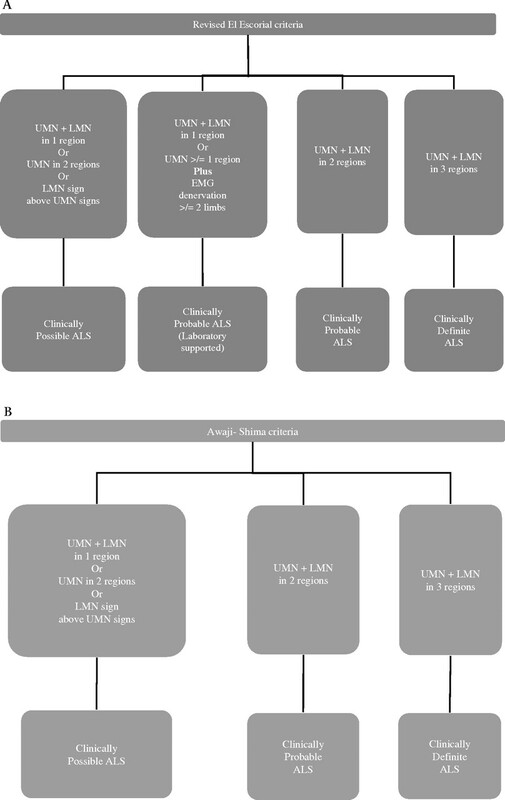 In 2006, an international symposium was held in Awaji-shima, Japan to determine the best use and interpretation of electrophysiological data in the diagnosis of ALS.6 The Awaji-shima criteria proposed that electrophysiological and clinical signs of lower motor neuron (LMN) degeneration be given equal weight in the decision as to which diagnostic category the patient is assigned. The revised El Escorial criteria do not allow the EMG and clinical abnormalities to be combined in a single limb; a limb must be determined to be abnormal by one technique or the other. The Awaji-shima criteria, by accepting neurogenic EMG abnormality as equivalent to clinical abnormality, allow a currently strong limb to be classified as abnormal earlier than if the decision were based on EMG or clinical criteria alone.6 This renders the clinically probable laboratory-supported ALS category redundant, as all categories can now use laboratory support in the diagnosis. A further significant difference in the Awaji-shima criteria, is the reintroduction of fasciculation potentials as evidence of acute denervation, equivalent to that of fibrillation potentials and positive sharp waves. This is similar to the Lambert criteria, and it has been suggested that these changes will increase the sensitivity of the diagnostic criteria for ALS without changing the specificity.8 The El-Escorial criteria did not include fasciculations as part of the diagnostic criteria, as they were considered to be less specific than fibrillations and could produce false-positive results. The fasciculations that are accepted in the Awaji-shima criteria are not the simple and stable fasciculations that may occur in benign conditions but unstable, complex fasciculation potentials in the presence of unstable motor unit potentials in the context of suspected ALS. The aim of this study was to determine the sensitivity and specificity of the Awaji-shima criteria for diagnosing MND in a clinical/non-research setting as compared with the revised El Escorial criteria. The neurophysiology department database was interrogated to identify 250 consecutive patients, who had been referred from 1 January 2000 with motor neuron disease included in the differential diagnosis. This time period was chosen, as it would allow sufficient time for the interval diagnosis to become clinically evident. Two hundred and five patients had full clinical records and EMG results available. The results of the electromyography and nerve-conduction studies were re-examined, and changes in chronic denervation and in active denervation (fibrillation potentials and positive sharp waves and/or complex fasciculations) in each area of the body were recorded. The nerve-conduction studies were recorded as normal/supportive of MND, or the alternative diagnosis was recorded. All patients included in the study had a proximal and a distal muscle in an upper and lower limb sampled, and a bulbar muscle was also examined where indicated. A sensory and motor nerve-conduction study was performed in an upper and lower limb. The clinical notes were examined. The clinical signs on presentation were recorded as positive or negative for upper motor neuron and/or lower motor neuron signs in each area of the body. The clinical diagnosis from the last review was recorded as the interval diagnosis. The clinical notes and the corresponding neurophysiology reports of 205 patients referred for EMG with suspected MND were reviewed. The interval diagnosis was MND in 107; of these, 97 were limb onset amyotrophic lateral sclerosis, and 10 were bulbar onset ALS. Three patients had a family history of MND but were all SOD1 negative cases. The interval diagnosis in the remaining cases was varied. The largest groupings were neuropathies (22), radiculopathies (19) and benign cramp fasciculation syndrome (six). The remaining 51 had no evidence of neurological disease or a wide variety of disorders, with no suggestion of MND. The mean duration between initial clinical presentation and assessment, and assigning the interval diagnosis in this study was 89 months (range 65 to 116 months). The mean age of patients with MND was 64.3 (range 31 to 95). The mean duration of symptoms at the time of initial clinical presentation was 17.9 months (range 1 to 192 months) and mean time from clinical presentation to EMG was 1.2 months (range 0 to 37 months). The mean length of follow-up was 16.3 months (range 1 to 87 months). There was an approximate 3:1 male to female ratio. On clinical examination alone prior to the neurophysiological assessment, using the clinical El Escorial criteria, 21 patients had a clinically probable and 12 patients had a clinically definite diagnosis of ALS. These 33 patients were classed as having a positive MND criteria diagnosis. One hundred and two were assigned to the clinically possible ALS category, and 70 patients could not be assigned a diagnostic category. These 172 patients were grouped together as being considered to have a negative MND criteria diagnosis. When the EMG information, interpreted as per the revised El Escorial criteria, was added to the clinical information, there were 22 patients with clinically probable and 12 with clinically definite MND, giving a total of 34 patients with a positive MND criteria diagnosis. One hundred and one patients had clinically possible MND, and there were 70 patients who did not reach a diagnostic category, making a total of 171 patients in the negative MND criteria diagnosis group. Using the Awaji-shima criteria, the number of patients assigned a positive MND criteria diagnosis rose to 69 (clinically definite 15, clinically probable 54), and the number in the negative MNG criteria diagnosis group fell to 136 (clinically possible 67, those outside a diagnostic category 69). The number of patients attaining a positive criteria diagnosis which may allow entry into a clinical trial or the commencement of therapy is approximately double that of the El Escorial criteria (see figure 2). Diagnostic categories of patients with confirmed amyotrophic lateral sclerosis as determined by the criteria. Using the numbers of patients with a positive or negative MND criteria diagnosis and the numbers of those patients who had a final interval clinical diagnosis of ALS or another diagnosis (table 1), we were able to calculate the sensitivity and specificity of the two sets of criteria. Using the clinical neurological examination findings (ie, presence or absence of upper and lower motor signs), interpreted using the revised El Escorial clinical criteria, to make the diagnosis of MND had a sensitivity of 27.1%. When information from the EMG was applied using the revised El Escorial criteria, the sensitivity rose to 28%. Using the Awaji-shima criteria, however, increased the sensitivity to 60.7%. The specificity of each of the three methods was 95.9%, indicating that there were no more false positives with the new criteria (table 2). The Awaji-shima criteria have been shown to increase the sensitivity of diagnosis of MND compared with the revised El Escorial criteria, without any increase in the false-positive rate. There were four patients who developed clinically probable ALS despite their final clinical diagnosis not being ALS. They gained this false-positive diagnosis through the clinical signs (upper and lower motor neuron signs in two regions of the body due to degenerative spinal cord disease) rather than through the extra information gained from the neurophysiology testing. The Awaji-shima criteria would have categorised 35 more patients as having a positive diagnosis than the El Escorial criteria (69 vs 34 developed clinically definite or probable). These 35 patients could have been entered into clinical trials at this point, and neurologists investigating these patients may have felt more confident in giving a definite diagnosis to the patients and initiating Riluzole and supportive interventions. In January 2009, De Cavalho and Swash suggested that the Awaji-shima algorithm superimposed onto the El Escorial criteria in a research setting created an increased sensitivity of diagnosis.9 The sensitivity was increased to 95% using the Awaji-shima criteria compared with 53% when applying the revised El Escorial criteria. They studied 55 consecutive patients previously diagnosed as having ALS by standard clinical techniques in whom neuropathies had been excluded by sensory and motor nerve-conduction studies. They performed extensive EMG studies in at least 10 sites in each limb and cranially innervated muscle. Additionally, in 44 of the 55 patients, the diaphragm and a trunk muscle were also studied. This level of investigation in a selected group of patients in a research setting may account for the higher sensitivity than we achieved in our less selected clinical group of patients. The specificity of the criteria was not investigated in their paper, however, and so our study is the first to demonstrate that the criteria are specific even in a clinical setting with standard neurophysiological testing. Using the Awaji-shima criteria facilitates an earlier diagnosis in patients with MND. This may have benefits in reducing periods of diagnostic uncertainty, reduce repetitive testing, enable earlier recruitment into clinical trials and commencement of supportive treatments and Riluzole. The authors would like to thank J Jarratt and A Chattopadhyay, for the neurophysiological testing of patients, the Sheffield neurologists, for allowing access to the notes of their patients, and their secretaries, for assistance in obtaining the notes.
. Electromyography in amyotrophic lateral sclerosis. In: Norris FH, Kurland LT, eds. Motor neuron diseases. New York: Grune and Stratton, 1969:135–53.
. El Escorial World Federation of Neurology criteria for the diagnosis of amyotrophic lateral sclerosis. Subcommittee on Motor Neuron Diseases/Amyotrophic Lateral Sclerosis of the World Federation of Neurology Research Group on Neuromuscular Diseases and the El Escorial Clinical limits of amyotrophic lateral sclerosis workshop contributors. J Neurol Sci 1994;124(Suppl):96–107.
. Clinical neurophysiology in the diagnosis of amyotrophic lateral sclerosis: The Lambert and the El Escorial criteria. J Neurol Sci 1998;160(Suppl 1):25–9.
. Electrodiagnostic criteria for diagnosis of ALS. Consensus of an international Symposium sponsored by IFCN. December 3–5 2006;Awaji-shima, Japan.
. The electromyographic diagnosis of amyotrophic lateral sclerosis: does the evidence support the El Escorial criteria? Muscle Nerve 2007;35:614–19.
. Editorial. Diagnostic criteria for amyotrophic lateral sclerosis (ALS). Clinical Neurophysiology 2008;119:495–6.
. Awaji diagnostic algorithm increases sensitivity of El Escorial criteria for ALS diagnosis. Amyotrophic Lateral Sclerosis 2009;10:53–7.